Stocks are poised to extend their record-breaking run Friday as markets open after the Thanksgiving break for the final trading session of the month. U.S. stock futures were edging higher, with the Dow Jones Industrial Average and the S&P 500 each adding 0.2%, and the tech-heavy Nasdaq up 0.4%. 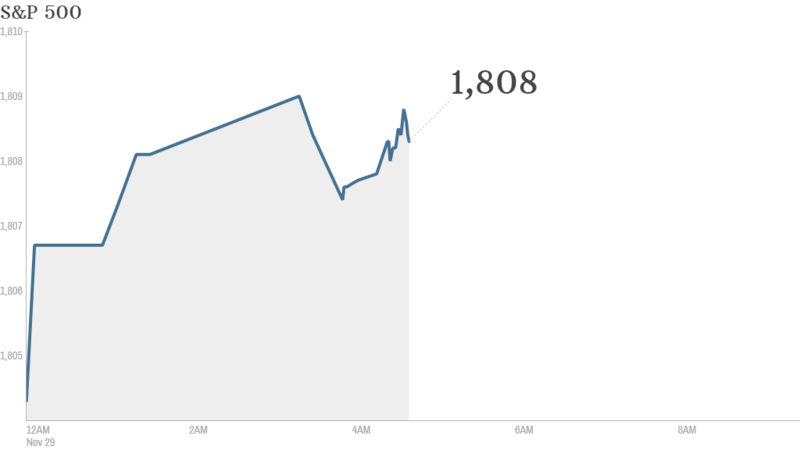 Trading is likely to be quiet Friday, with U.S. indexes closing at 1:00 p.m. ET after being shuttered Thursday for the Thanksgiving holiday. Retailers could be in focus as Black Friday gets into full swing. The annual shopping bonanza kicked off earlier than usual, with some of the biggest stores such as Kmart (SHLD), Wal-Mart (WMT), Best Buy (BBY), Macy's (M) and Target (TGT) opening their doors on Thursday evening. Early deals were disappearing fast. The upbeat start tracks a strong finish for U.S. stocks Wednesday. Solid corporate earnings and continuing bond purchases by the Federal Reserve have helped spur strong buying this month, pushing the Dow and S&P to record highs. It was a fairly muted day across global markets. Major European stocks were struggling for direction in morning trade, with London's FTSE inching up 0.1%. Asian markets were mixed, with China's Shanghai Composite edging up, while Japan's Nikkei retreated from a six-year high to close down 0.4%.